As a complete surround sound system package, the Frisby FS-6600BT includes everything you need including tower satellites, accessories and the necessary cables all in one package. You can connect any Bluetooth enabled device; your phone, tablet, media player or even your computer. Bluetooth provides clear high quality 5.1 sound from all satellite speakers and woofer from up to 30 feet away. The subwoofer features an LCD screen, front panel control buttons and an infrared remote control. Frisby FS-6600BT supports Bluetooth 5.1 technology for streaming audio wireless from devices that are Bluetooth-enabled. For other non-Bluetooth devices, there is a 3.5mm auxiliary input port. Additional conveniences include media ports which will allow you to play your favorite songs on a USB stick or SD card. This wired 5.1 home theater system has 6 RCA outputs for the wired tower satellite speakers. It also includes 8 RCA inputs for your TV or PC sound card. 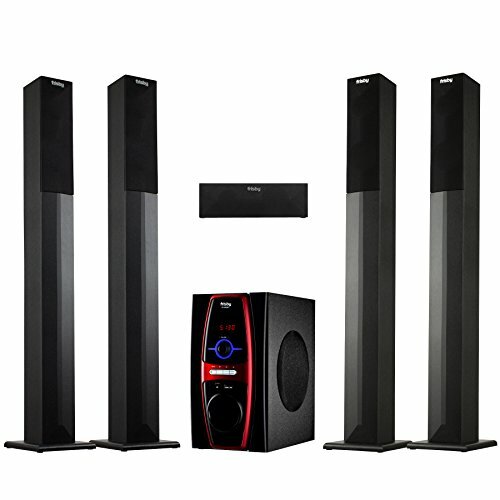 This system will provide your room with high quality balanced sound. All of the speakers and the subwoofer are magnetically shielded to provide the protection against image distortion from external electronic sources that are near the system. WARRANTY: 1 year warranty exchanges for factory defects. ***-Please note that all speakers of the set are connected using wires to the back of your subwoofer***. SUBWOOFER Driver Size 5.25 inches, Impedance 8 ohms, Signal to Noise Ratio 75 dB, Input Sensitivity 400 mV, Frequency Response 20Hz - 200Hz, Watts RMS 50 Watt Root mean square value (effective value of net power), Dimensions-Width: 7.8" Depth: 13.3" Height: 14.5", SATELLITES Driver Size 3 inches 1.5 inches, Impedance 4 ohms, Signal to Noise Ratio 75 dB, Input Sensitivity 500 mV, Frequency Response 100Hz - 20kHz, Watts RMS 15 watts per channel, Dimensions-Width: 3.7" Depth: 4 " Height: 37"